Technical analysts build trading strategies based on trends and patterns in the markets' movements. Their task requires mastery of the world's markets and an understanding of the latest techniques. Breakthroughs in Technical Analysis reveals the new trading methods used by the world's top technicians. 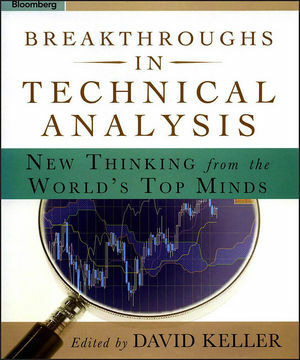 Building on the success of New Thinking in Technical Analysis (Bloomberg Press, 2000), this book, edited by Bloomberg L.P.'s own expert on technical analysis, David Keller, brings together market masters from the around the world. Some of their techniques have never left their country's borders before and are not widely known or used in other parts of the world. Showing what the best and the brightest are currently using to deliver extraordinary results, this book will be eagerly sought out by all market technicians. David Keller, CMT, is a technical analysis application specialist with Bloomberg L.P. in New York and the chair of the New York region for the Market Technicians Association. Keller has conducted numerous seminars across North America on applying technical strategies to the equity, commodity, and foreign exchange markets. He has also presented sessions on combining fundamental and technical strategies for the CFA Institute, Canadian Society of Technical Analysts, and American Association of Individual Investors. He is the author and creator of the Bloomberg Weekly Technical Strategy Report, an exclusive newsletter for Bloomberg customers. 1. Drummond Geometry: Picking Yearly Highs and Lows in Interbank Forex Trading (Ted Hearne). 2. Trend Spotting With TD Combo (Tom DeMark). 3. Charting With Candles and Clouds (Nicole Elliott). 4. Reading Candlestick Charts (Yosuke Shimizu). 5. Price and Time (Constance Brown). 6. Unlocking Gann (David E. Bowden). 7. Options-Based Technical Indicators for Stock Trading (Bernie Schaeffer). 8. Point and Figure Analysis: Modern Developments in an Old Technique (Jeremy du Plessis). 9. Deconstructing the Market: The Application of Market Profile to Global Spreads (Robin Mesch). 10. The Ten Commandments (Robin Griffiths).